Although our diet is mostly based around organic whole foods, anyone who knows us will gladly attest to the fact that we are somewhat obsessed with sweet treats and baked goods. 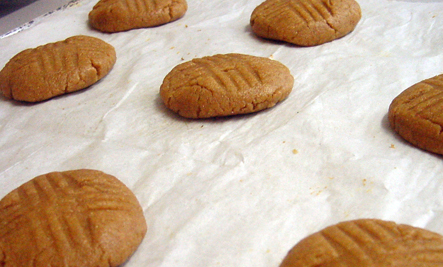 Home-made vegan cookies are no exception. Add a few non-dairy chocolate chips to the recipe, and we’re lucky if the dough can even make it into the oven! Many (though not all) of our cookie recipes use the powdered egg replacer that can be found at your local health food store, online, or in some really good grocery stores. It’s a really easy way to replace eggs in baking. If you have your own favorite cookie recipe you’d like to ‘veganize’, but don’t have access to egg replacer, there are many other ways to replace common non-vegan ingredients. Also, we like to use cold-pressed organic sunflower oil for baking, because it’s very mild-flavored. But you can feel free to use whatever your favorite oil is for baking. 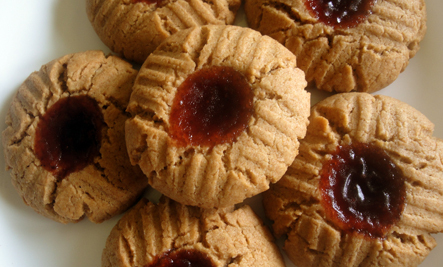 Following are two recipes for Thumbprint (jam-filled) Cookies (each slightly different), along with a collection of other dependable recipes for our fellow cookie monsters… and those who love them. Thumbprint Cookies are one of the most festive-looking cookies, so they’re a favorite of mine for entertaining. They’re beautiful to look at as well as being delicious to eat! On top of all that, they’re also fun to make! This recipe uses grated lemon or lime peel, which makes it really fruity and zesty… Yum. If you just don’t have the time to grate all that lemon, try using 1/2 a teaspoon of lemon essence instead. Alternatively, you can use half the lemon zest and use 1/8 cup of lemon juice instead of the water. 1. In a bowl, sift flour and baking soda. 2. Mash tofu and blend well in a blender with remaining ingredients, except for the jam. 3. Pour wet mixture into the dry and mix. If batter is too sticky, add a little more flour. 4. Roll dough into balls and flatten somewhat on a cookie sheet lined with baking paper. Criss-cross each cookie with a fork. 5. Using your thumb, or the rounded end of a kitchen utensil, as pictured, put a ‘thumbprint’ in the middle of each. 6. Fill each ‘thumbprint’ with with half a teaspoon of jam. 7. Bake in a pre-heated oven at 350° for 10–5 minutes or until golden-brown. 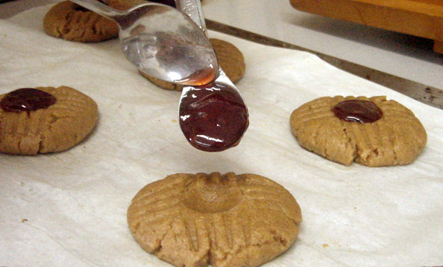 If you prefer a jam-filled cookie that’s not quite so tangy, try this version of the Thumbprints. Instead of lemon flavoring, this one uses almond essence, making it very rich instead of zesty. 1. Sift together flour and baking soda in a mixing bowl. Mix well, and add chopped walnuts. 2. Mix the water and egg replacer with the oil, sweetener, vanilla and almond extract. 3. Add the liquid to the dry. Mix well and chill in the freezer for 5–10 minutes. 4. Roll dough into balls and flatten somewhat on a cookie sheet lined with baking paper. 5. As illustrated on the previous page, criss-cross each cookie with a fork. 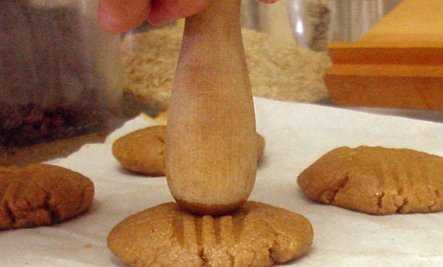 Using your thumb, or the rounded end of a kitchen utensil, put a ‘thumbprint’ in the middle of each. Fill with ‘thumbprint’ with half a teaspoon of jam. 6. Bake in a pre-heated oven at 350° for 10–13 minutes. Outrageous Cookies are our go-to recipe for a quick, easy treat that comes out great every time. Walnuts, raisins, and chocolate chips, are all optional variations, but feel free to try out your own – pecans, dates, carob chips… Experiment away! 1. Sift flour, baking powder, salt and baking soda into a bowl. 2. Mix wet ingredients, including sweeteners. 3. Add the dry to the wet, then add raisins and walnuts. Mix. 5. Bake in a pre-heated oven at 350° for 14–15 minutes. Allow to cool before serving. 1. Combine dry ingredients (except sweetener) in a bowl. 2. Blend sweetener with remaining wet ingredients in a blender or with a whisk. 3. Add dry ingredients to the wet, and mix. 5. Bake in a pre-heated oven at 350° for about 10 minutes or until golden-brown. 1. Sift dry ingredients (except sweetener) into a bowl. 2. Blend the remaining ingredients (except walnuts) in a blender. 3. Add wet mixture to the dry and mix, folding in walnuts at the end. 5. Bake in a pre-heated oven at 350° for 12–15 minutes, until bottoms are golden-brown. 1. In a bowl, sift together flour, baking soda, salt and baking powder. 2. In a separate bowl, mix egg replacer mixture, oil, vanilla, sweeteners and soy milk. 3. Add dry mixture to the wet batter. Mix. Fold in chocolate chips. 5. Bake in a pre-heated oven at 350° for 10–15 minutes or until cracks appear on top. Bottoms should be lightly browned. 1. With a whisk, blend together oil, sweeteners, water and vanilla until fluffy. 2. Sift together flour, baking soda, sea salt, cinnamon and soy powder. 3. Add dry to the wet and stir. Add oats and raisins and mix thoroughly. 5. Bake in a pre-heated oven at 350° for 12–17 minutes or until golden-brown on the bottom. Optional ~ Add 1–2 teaspoons of maple or almond flavoring.